I have many memories of my dad working around the house on various renovations or working on a vehicle in the driveway. He had a workshop full of tools and a large toolbox filled to overflowing. Many of the tools within were mysterious to me as I had no idea what their intended purpose was. But whatever the job, there were a few tools that were always included. One in particular stands out in my mind — an orange screwdriver with a cap on the end. You could unscrew this cap and inside were 10-15 different bits which could inserted in to the tip of the screwdriver. That’s old hat now, but in the early 80’s, having one screwdriver for any type of screw was a novel concept. There is something to be said for a tool that performs multiple functions. The Swiss Army Knife has long been the epitome of this concept. Through clever design, a tool intended for one purpose was adapted so that additional functions could be performed, but without interfering with the original purpose. The term “Swiss Army knife” is sometimes used metaphorically to describe usefulness, such as a software tool that is a collection of special-purpose tools. On OS X, there are an array of tools that fit into this category. 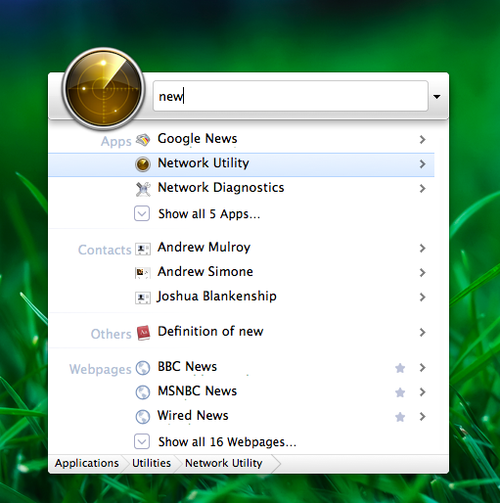 Applications such as Butler, LaunchBar, and Quicksilver are great examples. Each of these tools has its fanatical group of users that touts one over the other, but in reality, they all attempt to fill in some of the gaps left in the operating system. And they do a pretty good job of it. Ever since I bought my first Mac, Quicksilver was a tool that always intrigued me. My initial uses of the tool were to use it as a glorified application launcher. Spend a little time reading about this tool around the Internet and you’ll find that the same is true for a lot of people. But one day I needed to find a faster way to work with images and I was shown how Quicksilver could do what I needed — and much faster than I could manually in one of my graphics applications. If you read that and think to yourself, “Yes, but what does that mean?”, fear not. It’s difficult to fully understand the tool at first. In fact, the only way to gain a good understanding is to simply use it. From the moment I found that I could resize and convert a group of images with a few keystrokes, I looked for more ways to make use of the power of Quicksilver. Over the course of a 12 months, it became a regular part of many of my routine activities. It does such an excellent job of extending the capabilities of OS X that it saved me hours over the course of a year. So I was dismayed when rumours that started to surface that Quicksilver would not work with Snow Leopard. It turned out that with a new version it did indeed work, but I made the decision to take a thorough look at a couple of other options. The tools I chose to look at were LaunchBar and the Google Quick Search Box. Released by the Google Mac team last year, the Quick Search Box is a little behind the other offerings in this category. It has nowhere near the features that LaunchBar and Quicksilver offer, but it’s such a new release that it only makes sense that the feature set will grow. The important bit about the QSB (Quick Search Bar) is that Jitkoff — the original mind behind Quicksilver — is now employed at Google and is working on this product. So while Quicksilver is firmly in the hands of open source developers, its creator is working on a similar product for Google themselves. And while it’s not anywhere as complex as its predecessor, QSB has already replaced Quicksilver for a lot of people. The issue is that those people are the ones who used Quicksilver primarily as an application launcher. Those of us who used the more robust features will most likely find QSB a bit lacking. Developed by Objective Development, LaunchBar has also been around for some time and has a lengthy set of features as well. In addition, it has been touted by some of the more well known bloggers in the Mac community. In all my findings, LaunchBar and Quicksilver are very comparable. In the end, the only major difference I found was in the area of graphics that I mention in above. An example: I could pass a group of images to Quicksilver, specify an exact width for resizing each, and then change the file type — all in one step. 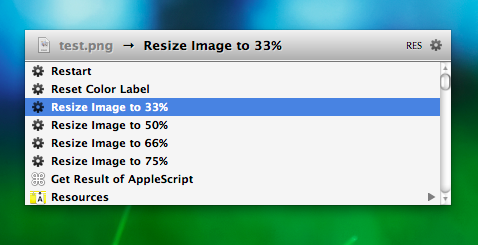 This was not quite possible with LaunchBar as it only supported resizing images to a specific percentage. Apart from that, both tools met my needs just fine. The usage was different, but both can do what I need. Here’s a few of the comparison’s I made between each tool for the categories important to me. Despite the fact that many people will argue which of these tools is better than all the others, I know from experience that it simply depends on your needs and preferences. If you are used to one over the others, stick with it. If you have a need that only one can fill, use it. In my case, I no longer regularly perform the particular piece of work that required me to resize large groups of images to a specific size and file format. So when I got around to installing Snow Leopard and my install of Quicksilver promptly crashed, I purchased LaunchBar. And never looked back. This is partly due to the fact that LaunchBar fits my needs, partly because I like to support Mac developers, and partly because I didn’t want to wait for a new version of Quicksilver every time Apple upgrades to a new kitty. Navigation and launching: launching applications, switching to running applications, and opening or moving files or folders of course. Touch the mouse as little as possible. Clipboard history: whether with Quicksilver or LaunchBar, this feature is essential to me. To be able to type a shortcut and have access to the last 40 items that were copied to the Clipboard … I couldn’t work without this. Email: rather than invoke the Mail.app window, I start a new message from wherever I am with LaunchBar. Calculator: lastly, similar to Spotlight, LaunchBar is a quick and easy way to perform small calculations from within any application. This list is not exhaustive — but it’s my list. There is no point on writing how one of these tools is better than the others — and it’s not the point of this post. Because it depends on the needs of the user. Just like the Swiss Army Knife, which comes in many versions, you may use the tool for one or two particular extensions, but the guy next to you needs something completely different. The point here is that you pick one that works for you. Then spend some time learning it — there are inevitably some other features included that can save you some of your time. And with all you’ve got going on these days, more time is a good thing.